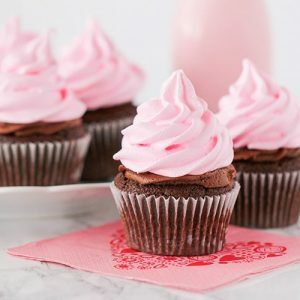 These delicious little sweetheart cupcakes start with one of my new favorite treats - pink meringue cookies. They're super easy to make and are fun way to top off your cupcakes. In a large bowl, beat egg whites with an electric mixer on medium speed until foamy. Add Cream of Tartar, beat on high and gradually add sugar, mixing until stiff peaks form, about 7 minutes. Place your meringue mixture into a large pastry bag fitted with your favorite decorating tip, I used a large French tip. On a baking sheet lined with parchment paper or a non stick baking mat, pipe large meringue swirls about 1.5 inches in diameter and 2 inches apart. Bake meringues for 3 hours or until meringues are completely dry and crunchy on the outside. It's easier to separate egg whites from the yolk if your eggs are cold. After separating your whites bring them to room temperature. This will cut down on how long you have to beat your egg whites. You can use regular granulated sugar, however, Baker's Sugar makes for a smoother meringue. It's finer and you're less likely to have pockets of sugar crystals. To add coloring or a flavoring extract to your meringues, quickly mix in a few drops of coloring and/or 1 teaspoon of flavoring after your stiff peaks have formed.